The following steps will guide you on how to configure the LAN and Wireless settings of a camera. Launch Internet Explorer or any web browser. Enter the Camera's IP address in the Address field. The default IP address is 192.168.1.115. Then press [Enter]. The Welcome screen will appear. Click the Setup tab. On the LAN Settings, select the Configuration Type. You can choose to have Fixed IP Address or Obtain Address Automatically (DHCP). 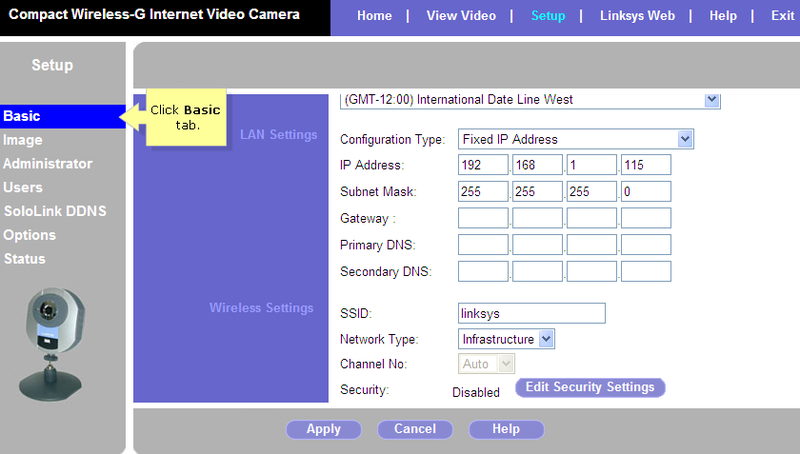 NOTE: For WVC54GCA, the Configuration Type is listed under Network Settings as shown in the following screen shot. Fill in the IP Address, Subnet Mask, Gateway, Primary DNS and Secondary DNS field. NOTE: You need to enter at least one DNS Address if you assigning a Static IP Address for your camera. Enter your existing network's SSID. At the Network Type value, select the network's mode: Infrastructure or Ad-hoc. NOTE: Choose Infrastructure if you're using an access point or router. Channel No value by default set to Auto. If the Camera is set to Ad-hoc mode, select the channel setting from the drop-down menu. To enable wireless security, click the Edit Security Settings button. 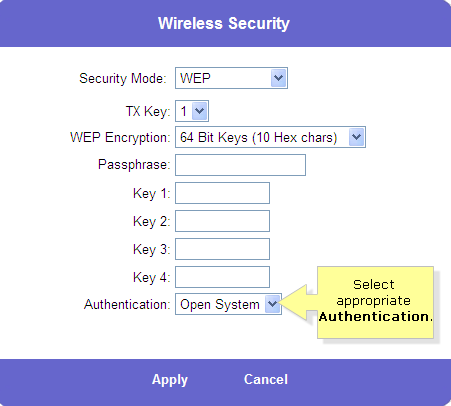 Choose the appropriate Wireless Security mode being used by your existing wireless network. 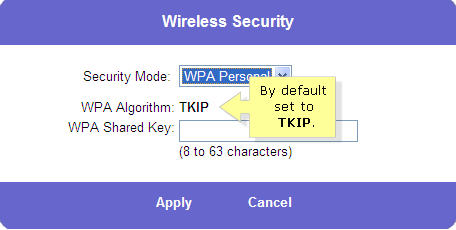 TKIP is the default WPA Algorithm. Enter the WPA Shared Key (also called Passphrase or Pre-Shared Key) used by your wireless network. It must have 8-32 characters. To save your changes, click the Apply button. To cancel your changes, click the Cancel button. If you decide to use WEP as your security method, skip Step 12 to Step 14. 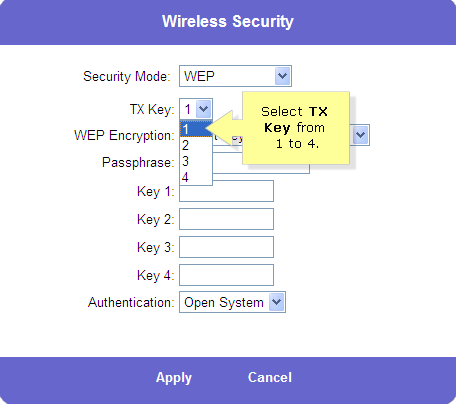 For the TX Key value, select key (1-4) which will be used when your network's access point or wireless router sends and receives data. 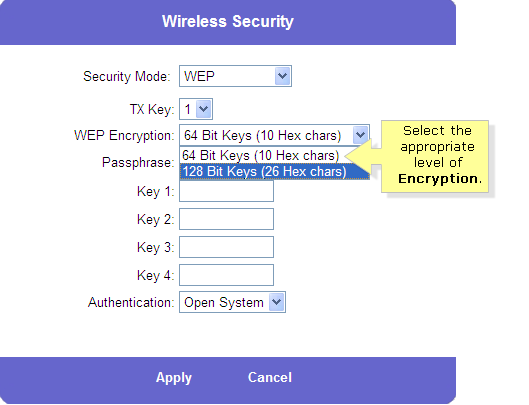 For the WEP Encryption value, select the level of WEP encryption you wish to use, 64 Bit Keys (10 Hex chars) or 128 Bit Keys (26 Hex chars). Skip the Passphrase value and manually enter the value in the Key 1 to Key 4 fields. NOTE: If you are using 64-bit WEP encryption, then each key must consist of exactly 10 hexadecimal characters. 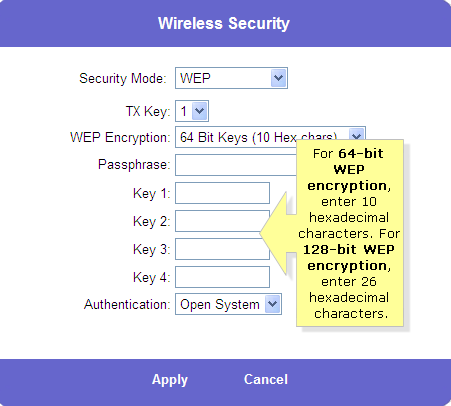 If you are using 128-bit WEP encryption, then the key must consist of exactly 26 hexadecimal characters. Valid hexadecimal characters are "0" through "9" and "A" through "F". For the Authentication value, default is set to Open System, for which the sender and the recipient do NOT use a WEP key for authentication. You can also choose Shared Key, when the sender and recipient use a WEP key for authentication. NOTE: These settings should match the one on your network's access point or wireless router. Go back to the main screen of Basic tab, click the Apply button. To cancel your changes, click the Cancel button.